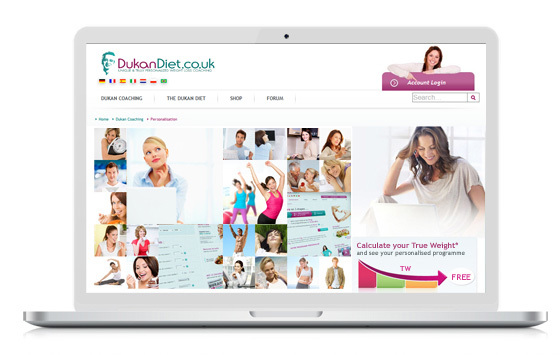 No other online service offers the level of personalised support that Dukan coaching does. Our programme also adds a new dimension to the Dukan Diet: daily monitoring. Any weight loss method can work in the short term, but for results to last and to avoid regain, the diet must accommodate each dieter’s profile and everyday living. Dukan coaching builds its strength on customised support based on nearly 100 specific personal factors. 1. Is your desired weight the weight best suited for you? 2. For how long should you follow the diet and what phases are involved? 3. How much will my coaching programme cost? When you subscribe to the service, our number one priority is to get to know you and your weight loss background. Coaching begins with a nutritional assessment based on a set of 80 specially-designed questions called Profil80*. Your answers enable us to establish a complete weight loss report. You can access this assessment in your slimming headquarters. It outlines your weight profile and the associated strengths and weaknesses which will need to be encouraged or corrected in order to stabilise your new weight in the long term. This same assessment is used to provide individualised coaching that effectively meets your needs and guides you as you work to achieve and sustainably consolidate your True Weight. *Profil80 analyses weight history, genetic factors, body shape, how physically active you are, eating habits, food preferences, your family and social environment and your willpower. Another exclusive feature of Dukan coaching is EMARQ Daily Email Return Technology. Every evening, members fill out a report and in the morning receive personalised instructions that incorporate the information you send the night before. In addition to these unique tools, our team of nutritionists is ready to listen and provide you with one-on-one support, as often as you need it, thanks to the private messaging service. Dieting is a serious decision. Ask your doctor for advice.